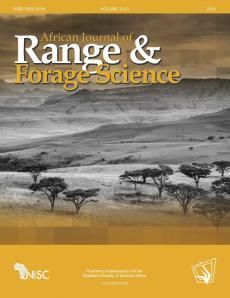 The study represents the first efforts since 1909 to develop improved Sudangrass (Sorghum bicolor (L.) Moench, syn. S. sudanense (Piper) Stapf) cultivars from the original genetic stock existing in the Sudan. Seven Sudangrass genotypes generated by individual plant selection within the land race ‘Garawi’ were evaluated across seven environments in Khartoum State in 2003–2006. Selection criteria were based on forage as well as seed-setting attributes. The objectives were to develop improved and reproducible cultivars from the parent population Garawi. The results indicated that two genotypes, S.(32-2)A and S.51, were superior to the parent population in forage yield, protein content, average stability of yield superiority and reproducibility. The increment in yield was attained without significant delay in flowering duration. Both genotypes were recommended for forage production under the traditional green chopping system. S.(32-2)A was officially released under the name Sudan-1 by the Variety Release Committee in February 2009. The newly developed genotypes will contribute to widening the currently narrow genetic base of Sudangrass cultivars. Seed of the newly developed genotypes can be provided in small amounts for research purposes upon written request to the author.